The artist duo Walter Hugo & Zoniel’s site-specific installation The Physical Possibility of Inspiring Imagination in the Mind of Somebody Living was exhibited in a derelict building in Toxteth in Liverpool and Gazelli Art House in Mayfair, and featured an impressive display of live jellyfish. The Liverpool installation was filmed and live-streamed at Gazelli Art House along with large format photographs of the jellyfish. Several images and a video are now available on Sedition as part of the Echoes of Toki collection. This surreal piece by the duo has since been presented at a location in Little Haiti in Miami during Art Basel Miami 2014. Sedition had the pleasure to speak with the artists about their practice, the themes present in their work and their chosen mediums. Sedition: How did you come to work together as artists and how do you work together on a project? Walter Hugo & Zoniel: Circumstance and nature put us together, and we’ve spent the last seven years together, 24/7 pretty much, so our dynamic just formed naturally from that. We work in total submersion on most of our work, and our dynamic often differs from one project to the next. We don’t have set roles that we each assume, our process is very fluid in that manner. Sometimes one of us will be particularly interested in a specific element of the process or going down a creative pathway, or have an idea for us to work on, whilst the other has a fascination for a really different aspect and working together gives us great freedom like that, as we have both a sounding board and immense space to explore whilst working sub-mersively together. Could you tell us more about the project The Physical Possibility of Inspiring Imagination... presented at Gazelli Art House and in Toxteth, Liverpool during the Liverpool Biennale? WH & Z: The work consists of a surrealist large-scale public installation and a live-streamed film that shows and connects the work to another environment. In this case it was Toxteth, Liverpool and Mayfair, London. 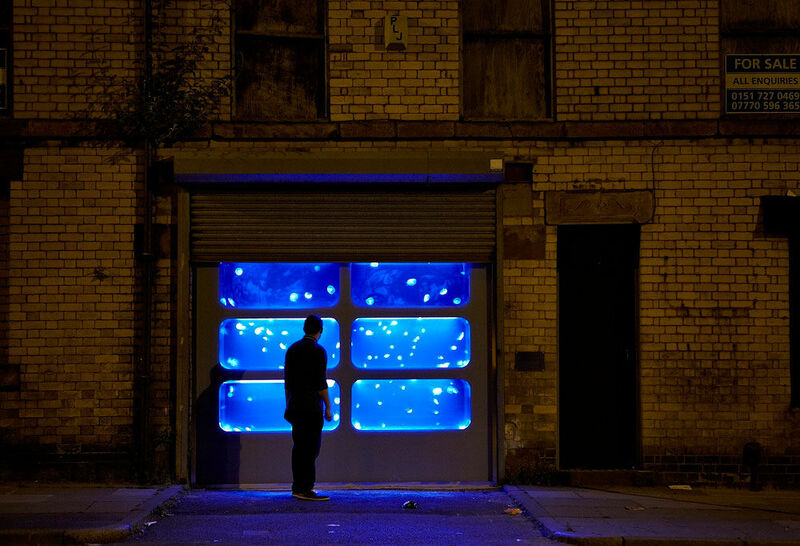 The installation involved us taking over a semi derelict building in Toxteth, and building a giant glass tank inside, which we filled with jellyfish. Each night at 10pm, as dusk turned to darkness, a metal shutter at the front of the building would open anonymously, which would reveal the jellyfish floating and glowing inside appearing to fill the building and coming right up to the street. Three hours later the shutter would go back down again and the work would close for the night. We opened the work a number of weeks before the Biennial so people who were walking past the building were given a dose of surrealism on their doorstep. Then during the Biennial, we set up a camera inside the installation and live streamed the view through the tank and the jellyfish into the street, this was projected onto the windows in the Gazelli Art House in London. Its a project that we’d had in the pipeline for a while and the circumstances came about in a really perfect manner to place it for the Liverpool Biennial this year and at the same time in London at Gazelli Art House. How did you come to realising the project across two different locations? What were some of the challenges? WH & Z: The connection developed naturally as we wanted the piece to be connected to an alternate environment and Gazelli proved perfect for that. The connecting installation in the windows of the gallery offered an altered sense of surrealism and beauty, and in itself showed the differences required to relate to people on the street. There were lots of challenges with this piece of work, ranging from the complexities of putting live jellyfish in an installation, where to get them from (some travelled over from Germany! ), to the technical issues of filming through the tanks and the live streaming. What questions do you want to raise or explore in the work? WH & Z: The piece is primarily about every individual’s ability to be inspired in any environment. Through this surrealism we immediately see our everyday environment in a very different manner and that in itself opens up a lot of questions; how and why we relate to it as we normally do, why this is surreal etc. Beauty, nature and the human condition are all elements that lurk somewhere in our work and they are definitely present here. There are also lots of subtle elements to the work that people seem to implicitly pick up on too, which is great. The social interaction and sense of ownership of the artwork being in a public space raise the questions of how we relate to art in different environments and how comfortable we feel with it consequently. Many people that came to view the piece were not aware that the Liverpool Biennial existed, even though it was in their own city, so it then formed a strong link with those people and all those other exhibitions. How does the work relate with the local community or local development in Toxteth? WH & Z: Well we have a strong relationship with Liverpool, with family connections there. As a city it houses 3 out of the 5 ‘poorest’ neighbourhoods in Britain, with Toxteth being the actual poorest, (for whatever statistics are worth). Toxteth still has quite a stigma attached to it, since the race riots there over 30 years ago, but it is right in the heart of the city and has always had a strong community attitude, even now when there is only one out of every ten houses occupied. So we wanted to place the work in an area that would not generally have a large-scale piece of public art installed in it and given those circumstances, Toxteth seemed perfect. The manner in which it was introduced there, with no publicity was also to highlight that sense of local community there. We obviously didn’t know what the reaction would be, but it was immensely positive and outshone any of our expectations. Thousands of people came to visit it while it was open, with some nights there were up to 100 people standing outside in the rain waiting for the shutter to open. It really was wonderful to see people take such pleasure in it and interact so much, it completely overwhelmed us. How does nature influence the process in which you create your artworks? WH & Z: The beauty in nature heavily influences us. Nature is the ultimate source of beauty and as an artist we can only aim to highlight it or capture an element or reflection of that. On a practical level we have used natural sources within many of our processes from creating giant seascape salt prints developed using seawater and archival washing them in a local stream to complete the cycle, to creating images using the darkest woods in the world for its exposure benefits. Certainly the cyclic nature of existence, which is very obvious within ‘nature’, is an on-going theme in many or our works, its something that is such a natural part of being human that it seems almost obscene to ignore it. Photography plays a big role in your work and also the camera obscura. How did you first become interested in the medium? WH & Z: Capturing light and our relationship with understanding that is really fascinating. We have utilised certain scientific processes, which were prolific in the early days of photography so some of our work is classified as photographic art, but we are most interested in utilising them conceptually to form part of a process of creating an artwork. The process has to naturally fit within the artwork and is conceptually as well as practically integral to it, rather than just using them for the sake of using the medium (as interesting as the medium is). What interests you about Sedition as a model for distributing art? WH & Z: Sedition plays on an element of what we were doing within the installation in Liverpool, as it seems to work on putting artwork in a different space for people to observe and relate to it. Most people have a very specific relationship with their computers as they are so integral to modern life, and so it is an interesting platform to reach an ever-developing modern audience.